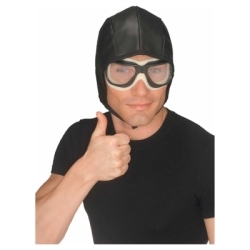 This aviator accessory kit is perfect for creating a World War I flying ace costume. It can also be used as an Amelia Earhart costume for school projects and reports. Many of our directors use this costume kit for Snoopy in "You're a Good Man Charlie Brown". The aviator costume accessory kit includes a black vinyl aviator helmet with ties and matching aviator goggles on an elastic band. One size fits most.